More than 600,000 children under age 6 have a parent in the military, according to estimates from the U.S. Department of Defense. Many military families face stressors beyond the day-to-day parenting challenges encountered by their civilian counterparts. 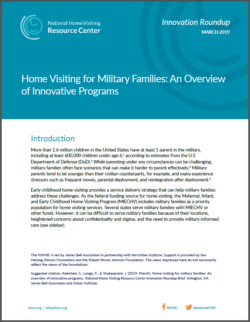 Military families are more likely to move often, for example, and many go through parental deployment and reintegration. Read the full brief to learn about each effort’s goals/purpose, key stakeholders, notable details, accomplishments, implications, and upcoming activities. There is also information on military-informed care and the deployment cycle.